Collaborative Genomics Projects: A Comprehensive Guide contains operational procedures, policy considerations, and the many lessons learned by The Cancer Genome Atlas Project. This book guides the reader through methods in patient sample acquisition, the establishment of data generation and analysis pipelines, data storage and dissemination, quality control, auditing, and reporting. 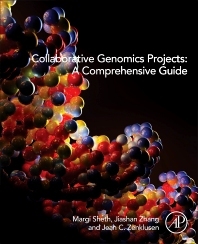 This book is essential for those looking to set up or collaborate within a large-scale genomics research project. All authors are contributors to The Cancer Genome Atlas (TCGA) Program, a NIH- funded effort to generate a comprehensive catalog of genomic alterations in more than 35 cancer types. As the cost of genomic sequencing is decreasing, more and more researchers are leveraging genomic data to inform the biology of disease. The amount of genomic data generated is growing exponentially, and protocols need to be established for the long-term storage, dissemination, and regulation of this data for research. The book's authors create a complete handbook on the management of research projects involving genomic data as learned through the evolution of the TCGA program, a project that was primarily carried out in the US, but whose impact and lessons learned can be applied to international audiences. Why Develop a Communications Strategy?